Let's mix things up a little. I bought a new computer! Decided, after much thinking & feeling, on an Thinkpad X61 Convertible Tablet. I had a tablet computer once, an Acer, which I did not fully utilize, but the sorts of things I'm doing now (furniture design, little drawings which may turn themselves into t-shirts & cards & such) would lend themselves to a computer one can draw on. The computer on which I compose this is an aging Thinkpad X40. I acquired it in 2005, so it's practically geriatric, as computers go. It's been to Ireland & France & all over the U.S. It's been dropped a few times & caught a bad virus when I first moved to Asheville. I appreciate it greatly & at the same time am excitedly looking forward to the arrival of the new one. Oh, it's snowing again. This is about the 3rd or 4th time it has flurried today, interspersed with utter sunshine & partly cloudy. Very cool. Yesterday we had the same type of pattern, but with rain. I awoke to a tremendous thunderstorm & then it sunned up & there were a spates of rain, from drizzle to downpour. Shoot, before I could even finish this paragraph we're back to sunny. That's the mountains for you. 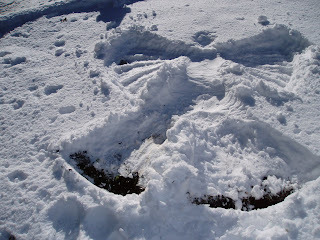 Okay, so I'll pick a picture for you-- "Self Portrait as Snow Angel" --& get back to getting things done. I had great intentions yesterday, of sending you all a valentine's message. Alas--or not alas, rather--I was having too much fun. After all, you can't love anyone more than you love yourself. Not even as much. I actually did send my kids & my parents valentines. Even postmarked before the date. Not much before the date, actually. Not enough to actually ensure that they received the valentines on the 14th o Feb, but postmark has to count for something, right? Not only did I send valentines, but each one was custom designed & hand drawn! Yay me. In honor of postmarks, I send an image I did for the postcard show at the Crossings Gallery a few years ago. For those of you in Minnesota, Wisconsin, Montana or some other state with crappy weather right now, you may want to skip the following little paragraph. It's partly cloudy with a high of 66 degrees (that's ABOVE zero) today. So beautiful. We get enough cold weather to appreciate the warmth that peaks through each month, but not much more than that. You can tell by lack of transitions that I'm still a little shaky on blogging. I suppose I should periodically explain the whole Blog alternative thing. If you so desire, go back to 18 April 2007 & see the genesis. The basic theory is this: you probably have better things to do than reading my blog, so in my blog (this makes no sense, really) I give you ideas for things other to do than reading the blog. Of course, you can't see my suggestions without reading my blog, so you may be better off coming up with your own ideas. Grin. I've been a little skittish about getting back to blogging in any major way. Why? I'm not entirely sure. I think there's a big component of not wanting to be a blogligation--on my part, or the part of the (what? don't you have a movie to make or a walk to take or silk to paint?) reader. 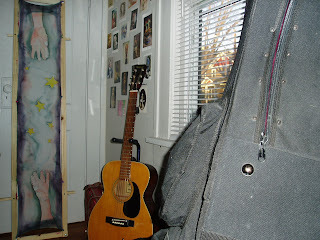 Here's a photo of one of my first efforts--with cello, guitar & postcards thrown in. I have many more things to write about, of a much more serious nature, like my dear Aunt Betty Lou dying suddenly of a massive stroke. She's the first of that generation to go. The funeral is today, with a wind chill of 18 below in Melstone, Montana. I guess it had to get that cold to usher her warm heart out of this world. Here's to Aunt Betty Lou, back to pure positive energy, & everyone who loves her, who are perhaps not feeling as pure & positive just now. No one could cook for a crew like Aunt Betty Lou, not even my own mom! I got my computer back, but not my emails. Mozilla ate my emails. (Sounds like a Japanese horror flick, doesn't it?) It actually didn't eat them, it swallowed them whole & spit them out & won't have anything to do with them. So, if you ever sent me a "keeper" email, it's gone. Very sad. I'm hoping some Thunderbird-savvy friend will be able to retrieve them someday. I think I've forgotten how to blog. It's probably Mozilla's fault. Anyway, I'm not feeling all transition-y, so I'll just leap from topic to topic. Here's some news! Give it a listen. My slippery wi-fi has been pretty slippery, so I haven't heard it yet. Tony at StarShipSofa contacted me at the beginning of the year, saying "Infinity Syrup" (my first pro sale, The Magazine of Fantasy & Science Fiction) was a "firm favorite" story of his & would I give permission for them to podcast it. I said heck, yeah! I've written & painted & straightened & purged (without any binges) & worked as a carpenter's assistant & had my car in & out of the shop (it's back!) & started looking at real estate listings again. Soon I'll remember how to blog again. This is just a test drive. You can ignore it. I do remember how to do the important part. 112. Redecorate your heart. Put new curtains up--or new windows & doors. Clear out clutter. Do you really need all those long dead corsages from high school dances? Let go of all the people you have locked in little cubby holes without their consent--or perhaps their knowledge. I took down all the walls on my heart & got rid of the furniture completely, so you could dance in it. Now I've decided to put a gazebo in the middle--I'm obsessed with gazebos, for some reason; I keep fantasizing about putting one in my living room--since there will still be plenty of room to dance. Not just any gazebo--a stained glass gazebo. It'll be like sitting inside a Tiffany lamp, but in a good way. Stop by & sit a spell, if you'd like.